Interior Features Say YES! to the Address in Aberdeen! 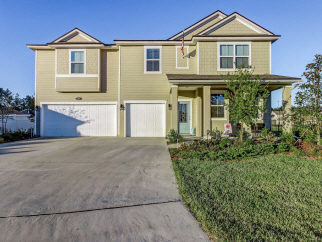 1 year old Cul-de-sac home for a Large or Multi-generational Family! This is a spacious open floor plan with wood look tile floors in main living areas. A Large kitchen boasts 42 in white kitchen cabinets, California bar with pendent lights, breakfast area, tile back splash, gas stove, double convection ovens and walk-in pantry. Upscale finishes throughout including Crown Molding in main living areas. Master Suite on main level includes en suite bath with over-sized garden tub, double vanities and separate shower. So much space to enjoy inside-over-sized bedrooms, living room/flex space upstairs. Check out the Angela and Howard Team Advantage...You will be glad you did!! !